Versatile and flexible modular system with numberless combinations. ADD is the perfect synthesis of an indoor modular system that can be adapted into and provide flair to any existing architectural or highly frequented environments. ADD collection consists of modular seating, table and storage solutions with endless configurations that meet the multiple requirements of the contract market. ADD system allows the greatest freedom in composing and personalising any environment with a multitude of finishes available among the collection. ADD modular seating is constructed with powder coated corner or linking legs in 320mm or 380mm height options and powder coated aluminium frames with elastic belts for optimal comfort, available in six sizes. The shape of the removable upholstered seat cushions is more padded in the middle and the contrasting stitches draw further attention to the seat. Optional upholstered backrests provide support for the back as well as adding a thin and elegant profile. Further accessories such as table tops, tray, magazine rack and box for sockets in HPL Fenix with powder coated metal parts can be attached to the frame in several positions using pre-drilled fixing points. Optional 90° revolving tablet case (suitable for iPad Mini 1-3, Air-Air2 and Galaxy Tab 3-4) is available in anodized aluminium with powder coated metal support. ADD T features modular table system with powder coated aluminium 740mm high corner or linking legs with HPL Fenix or timber table tops in square, rectangular or angled shapes. Table configurations are available with or without HPL Fenix modesty panel, HPL Fenix or timber partition panel, cable management or fixing to storage options. The flexibility of ADD T modular system make sit suitable for office, restaurant, common or any high-frequency environments. ADD S storage system plays with modules similar to the seating system, combining corner or linking legs with levelling feet to storage units in three different heights. ADD S storage units can either be open or closed with timber or upholstered drawers and doors. The storage units is available with two fronts, allowing it to be placed conveniently in the middle of office or communal environments. Optional electronic key, electronic key badge, key and powder coated drawer unit on castors is also available. Francesco Rota is an interior and product designer based in Milan. He was born in 1966, graduated in product design at Art Center College of Design in 1994, La Tour de Peilz (Switzerland), and in 1998 opened his own studio in Milano where he doesn’t limit his work within only one field. The secret to his long-lasting success lies in the wide scope of his interests: product, furniture, lighting, showrooms, offices, residential interiors, events, etc. In 2004 he lectured in a master’s programme at Istituto Europeo di Design in collaboration with Magis. In 2013 he was appointed creative director of Lapalma. Apart from introducing new products for the brand, he aims at strengthening their positions in the most demanding world markets – Europe, North America and the far East. Over the years Francesco has collaborated with a number of widely recognised brands such as Bals Tokyo, Barilla, Driade, Fiat, Frag, John Richmond, Knoll International, Lapalma, Lema, Living Divani, L’Oreal Paris, Malo, Martini & Rossi, Mercedes Benz, Moroso, Paola Lenti, Oluce, Versus. 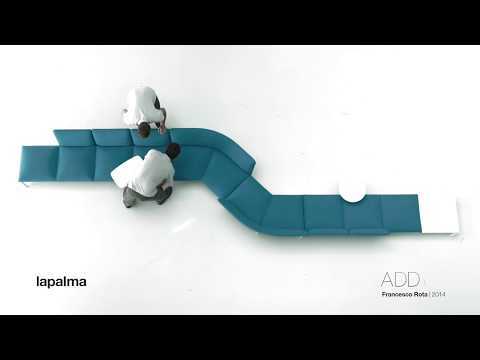 Francesco’s long-term collaboration with Paola Lenti and Lapalma has been extremely productive. He has been awarded with three honourable mentions for the Compasso d’Oro with ‘Linea’ and ‘Island’ and ‘ADD’, which are today in the Historical Collection of the ADI Compasso d’Oro Award. The products ‘Kanji’ and ‘Move’ were awarded The Good Design Awards in 2016, while ‘Screen’ was awarded WallPaper* Design Award in 2017. Francesco received as well a Special Mention for the German Design Award with the product ‘Daydream’, ‘ADD’, ‘Kanji’ and ‘Move’; The Red Dot Design Award with ‘ADD’ and ‘Kanji’ in 2016 and ‘Uptown’ in 2017, Muuuz International Design Award with the product ’Frame On’ and ’Smile’ and the Interior Design Best of the Year 2014 Awards with the product ‘Cloud’. In 2013 he was finalist for the Wallpaper Judges’ Award in the section ‘Designer of the Year’. The authentic values of Italian design - comfort, simplicity, functionality and visual appeal, are an integral part of Francesco’s philosophy and are present throughout all his works. He often finds inspiration in the beauty of the industrial production processes as well as in the aesthetics of popular iconic designs. Francesco’s products could be described as elegant, pure forms unaffected by time and fashion. He designs for various companies and environments but always with innate feeling for composition, delicate taste for colour and focus on functionality. His works are aimed at complimenting their settings and contributing to the general feeling of comfort. This design effort is greatly appreciated not only by his partners but also by the audience, a fact that is evident in the increasing interest in his work. He has taken part in several exhibitions held at: St. Etienne Biennale du Design, Hannover Messe, Triennale di Milano, Reggia di Venaria Reale Torino, Moss New York, Material Connection New York, Biennale di Architettura Venezia, Royal Academy of Arts London, The Merchandise Mart Chicago, Miami Design District, Biltmore Fashion Park Phoenix, Bellerive Museum Zurich. In addition, he has done spatial installations for Daimler Chrysler_Mercedes Benz during the 8th International Exhibition of Architecture in Venice at The Corderie dell’Arsenale in 2004 and the ‘Terrazza Martini’ for Martini&Rossi during the 62nd International Exhibition of Cinematography Art in Venice in 2005.